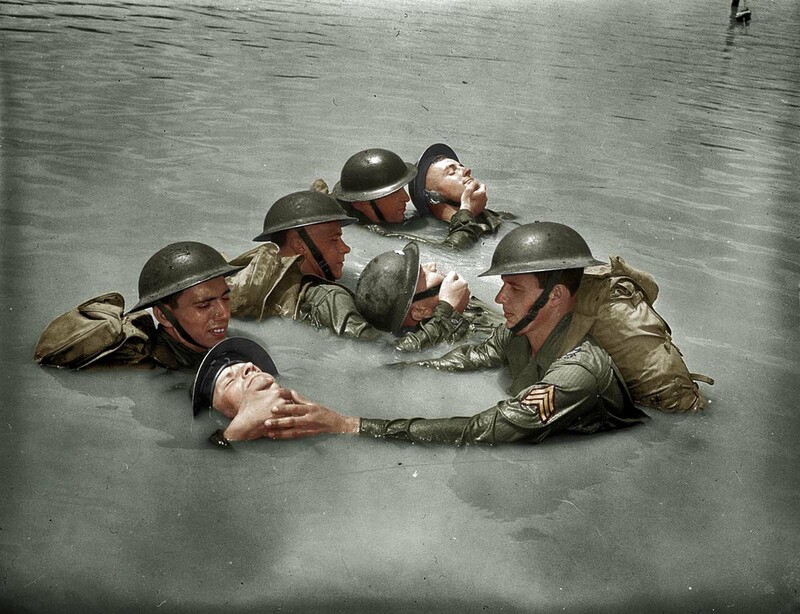 US soldiers in full field equipment learning the “chinpull” method of saving men from drowning, 1942. 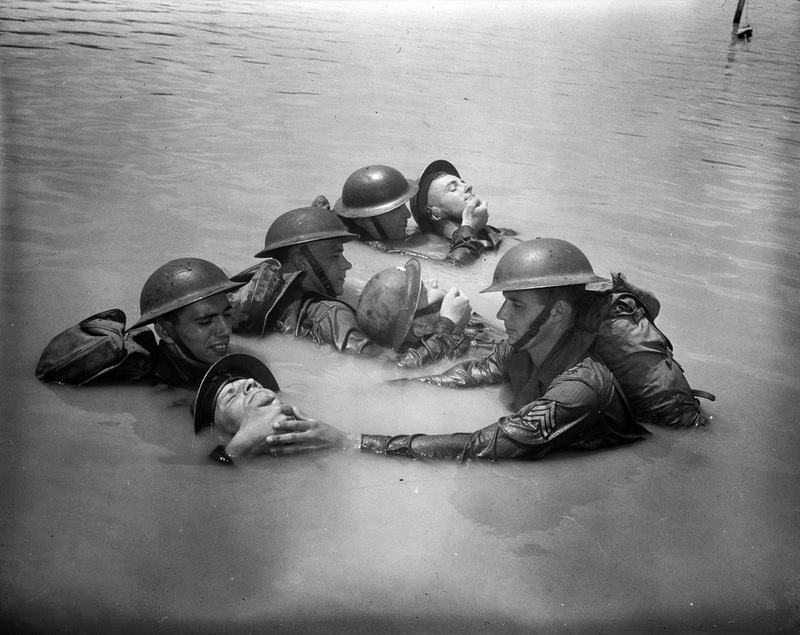 The chinpull method is similar to a life guarding technique, basically the soldier needs to get behind the victim and tow them along using one hand under their chin. This is pretty much guaranteed to keep their airway out of the water whilst leaving the rescuer an arm free to paddle and/or grab onto something else. It also makes it hard for the victim to drown the rescuer. However, this method is not recommended if someone is seriously injured. The uniform is the OD M1941 Herringbone Twill cotton uniform. The HBT or Herringbone weave pattern was introduced as the first ever “rip stop” type of fabric. It was robust, held up and performed well under use and distressed conditions, and was comfortable for the wearer. The US Army would eventually design several variations of HBT fatigue uniforms but the M1941 HBT uniform was the first ever. It consisted of a button front jacket, hidden pocket trousers. The trousers were modeled in the styling of the Cotton Khaki uniform trousers which incorporated hidden front, rear, and watch pockets, button fly, and full waist and fly lining. The jacket has button cuffs, side adjustment buckles, two pleated pockets with buttoned flaps. The packs appear to be the US M-1928 haversack. An upgraded haversack was developed in 1928 that had quick release buckles and a web strap and buckle closure on the meat can pouch replacing the metal button. However, the M-1928 haversack did not go into production until 1940, and older haversacks continued to be issued until stocks were exhausted. The Americans stopped using the style of helmet shown in the picture in 1942, but it is likely the old helmets were still around and used in training until eventually being completely replaced. Colored version of the picture (author unknown). (Photo credit: Office of War Information Photograph Collection – Library of Congress).